My unseen friend Viruddha Pakshikaya has embarked on a long tirade against President Mahinda Rajapaksa’s campaign last week and the thrust of his argument appears to be that the numerous cross-overs from the government to the Opposition indicates a victory for Maithripala Sirisena. Honestly, Viruddha Pakshikaya, I couldn’t be more pleased with some of the people pledging their support to Maithripala and what more reassuring sight than to have both the TNA and the Muslim Congress placing their faith in him. Why, you might ask? Please let me explain. Viruddha Pakshikaya speaks of a sense of déjà vu about this campaign being similar to that in 1977. I am not of that vintage, but now, I too have a sense of déjà vu, one that most voters at this election can relate to: Isn’t this very much similar to what happened in 2010 with Sarath Fonseka’s campaign? Take a look at the people in Sirisena’s team: Ranil Wickremesinghe, Chandrika Kumaratunga, Sarath Fonseka, the JVP and now, Hakeem and his SLMC and Sampanthan and his TNA. The only person who is the odd one out from the 2010 campaign is none other than Sirisena himself! Otherwise, it is just a re-run of the 2010 Opposition campaign. The inclusion of the TNA and the SLMC, especially the former, resulted in the Sinhalese voting en bloc for Mahinda Rajapaksa in 2010. That is not because the Sinhalese are racist; but because they are realists; they have a genuine fear about what the TNA’s agenda is, more so when they are still in cahoots with the Eelam Diaspora. Let me refresh Viruddha Pakshikaya’s memory: this is the same TNA which is asking for more than the 13th amendment, the TNA which is demanding a war crimes probe, the TNA which wants the Army withdrawn from the North and the TNA which is still actively tarnishing Sri Lanka’s reputation globally. Maithripala Sirisena speaks of safeguarding the country against a war crimes probe and not withdrawing the military from the North. Yet, he is supported by the TNA. He is obliged to the TNA for the votes cache they will give him. How would he function if he becomes President and the TNA wants to cash in on the I-O-Us they gained in return for their support in the North and East? Yesterday the pro-LTTE Sri Lankan born American rapper, MIA Tweeted asking Tamil voters to defeat the Rajapaksa dictator. Isn’t the cat out out of the bag? And, alongside the TNA, who else does Maithripala have on stage? The likes of Champika Ranawaka and Athuraliye Rathana thera. That is hardly the recipe for a stable government, is it? So, are we to believe that they will lie low while Sirisena pacifies the TNA and we will all live happily ever after? If so, Sirisena’s manifesto must have been written by Hans Christian Andersen! The point is, Viruddha Pakshikaya, voters have now lost track of who crossed over to which party and who is supporting whom. They are looking for a government that is stable and can deliver the goods-which the Rajapaksa administration has done, to a large extent. What they don’t want is a hodgepodge coalition where every partner is demanding more than his share-and that is exactly what Sirisena is offering. And while on the subject of cross-overs, Viruddha Pakshikaya is ecstatic about the cross-over of Rishard Bathiudeen. Please permit me, Viruddha Pakshikaya, to enlighten you about him. This is a man who instigated a mob attack on the Mannar magistrate two years ago and was accused of making threatening phone calls to the magistrate. He was later charged with contempt of court by senior lawyers after the Bar Association of Sri Lanka strongly condemned his actions. These are the guys who are promising good governance in this country. Thereafter, he apologised to court and the matter was settled-and the lawyer appearing for him was Faiz Mustapha, whose son Faiszer Mustapha also crossed over to the Sirisena campaign this week. Ah, birds of a feather, as they say! My question is, how can Maithripala, who preaches independence of the judiciary and pledges to restore Shirani Banadaranayake’s position and her privileges, have Bathiudeen on his campaign? Surely, can hypocrisy get any worse than this? Then, as far as the candidates themselves are concerned, what we have today is worse than the choice we had in 2010. At that time the candidate was Sarath Fonseka who, whatever his faults, could match up to Mahinda Rajapaksa in terms of his macho personality, voice, moustache, patriotism and all . In that campaign, he was the boss, he made his own decisions and spoke his own words-at times to his own detriment. Now we have Maithripala Sirisena, a decent man maybe, but someone who has to literally lean towards either Chandrika or Ranil for an answer, when he is asked a question at a press conference or a meeting with the business community. I don’t mean to be insulting but Transport Minister Kumara Welgama put it best: “Mahindath ekka balanakota, Maithripala mona pambayekda?” (“compared to Mahinda Rajapaksa, isn’t Maithripala a scarecrow?”). That is a question many voters must, and will, ask themselves before they mark their ballots on Thursday. I will be the first to agree that the Mahinda Rajapaksa regime has not been perfect and yes, mistakes have been made but after ten years in government, who wouldn’t make mistakes? Which government in the world doesn’t make mistakes? But the debit must be taken with the credit and see what the overall balance sheet produces. It has produced a country on the rise, economically; a country that has eradicated the menace of terrorism – a country on the move to be a modern state of the 21st century. On Thursday, we have a leader who has held the country together and undertaken infrastructure development on a scale never seen before, running against someone whose only credentials are a promise to abolish the Presidency (Or is it to reduce its powers?, I am not sure even he is certain about that). His recent catalogue of ‘achievements’ is what he couldn’t implement as a Minister – and he blames it on the President. He is happy to be a ‘puppet President’. He is going to a President for 100 days, he himself says. And then what? We are heading for a period of uncertainty after a period of certainty. 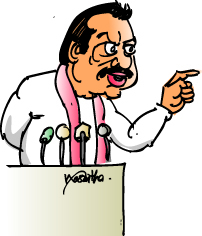 All the good work done by Mahinda Rajapaksa is going to be un-done. I rest my case, Viruddha Pakshikaya, I don’t need to say anymore.